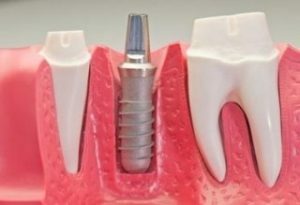 This category includes all the techniques that allow the recovery of occlusion and missing teeth with the use of artificial roots made with the most biocompatible material known to known: titanium, for endosseous implants. Thanks to the techniques currently available on the market, the success rate is 90% guaranteed, and the limited cases of failure are a result not of rejection, but local non-ossification, which does not lead to more serious general physical imbalances. FIRST PHASE: extraction of existing elements and reclamation of the previous oral zone. SECOND STAGE: dental implants usually 4 – 6 or 8. THIRD PHASE: application of the temporary prosthesis within a few hours. FOURTH PHASE: temporary prosthesis removal and final prosthetic application. Please note in particular that in the case of an All-on-4TM or All-on-6TM procedure (ie a complete dental arch), it is not always possible to have immediate loading in the form of a fixed prosthesis; in particular this occurs when one or more implants inserted do not have a primary stability of at least 35 Newton (soft bone). If this situation occurs, we will provide a temporary mobile prosthesis, in the form of a total prosthesis. 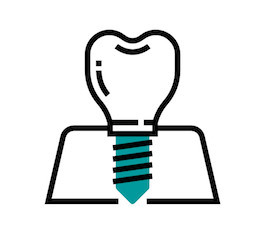 The patient will use the removable prosthesis to replace the fixed prosthesis for a period ranging from 3 to 6 months, and following this period the loading of the implants with a fixed temporary prosthesis will be done, which will subsequently be replaced by a permanent fixed prosthesis. • Cost savings, because of the entire procedure being done in one session.